We are introducing the simplest classified listings for all kind of 2 wheeler s and motorcycles in a rental process. Although you can modify the theme and designs as per your requirements which enables categories modifications whatever you desire. Our Rental Bike Listing Script is built with attired design coding style with Search Engine friendly structure with highly secured module based on Google standards which makes websites easily crawled by major search engines like Google, Yahoo and AOL etc. Our Rental Bike Script is simple to use with flexible booking system to get rental bike or cycle. Find the right Rental Bikes that saves your time and hassle free booking of all kind motorcycles, choose booking for booking bike and cycle through online as well as choose the pickup and delivery locations to a desired places. Dedicated admin panel the rental prices are modified based on the requirements by admin with scheduled dates. Our Classified Rental Two Wheeler Listing Script has filtering option to find favorite vehicles based on the results from the list of all biked as well as cycles. Nowadays rental plans are modified based on the customer satisfaction that are controlled by admin with monthly rental features. Our Bike and Motorcycle Listing Script supports extreme customization for all kind of motorcycle business modules with simple steps. Booking a motorcycles now even better and smarter way with our readymade Rental Bike Script, a perfect solution for the right professionals. Making your own unique way on bike rental have futuristic view that helps to get into a business in fruitful way for a long esteem. 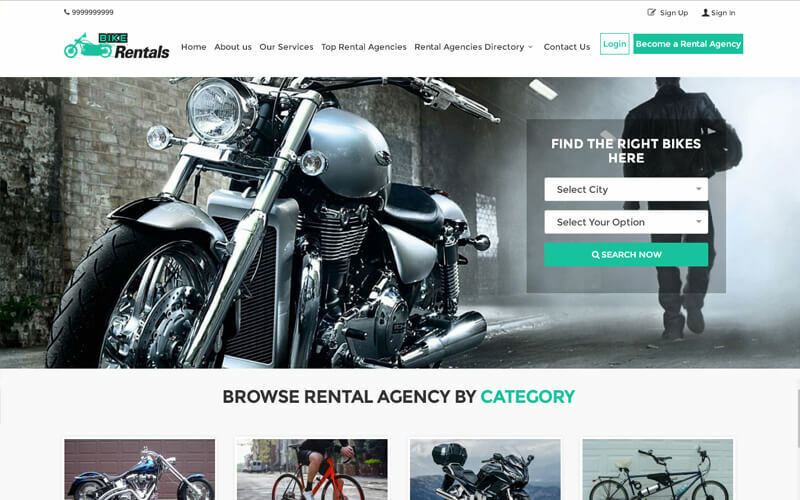 We are giving a path to success for all kind of business persons who are indeed and passionate to start rental website for motorcycles with daily or monthly rental plans. We make your website a unique in design with colorful templates and made search user friendly. Booking a rentals by nearest locations without any trouble to book and used for long term business plans.